SALAMANDER LEVIATHAN at Ars Nova from Krista Knight on Vimeo. Salamander Leviathan - San Diego from Krista Knight on Vimeo. Join us at these four off-site gigs! They’ll include songs from Salamander Leviathan as well as David’s Pegasus and Timber! originals! 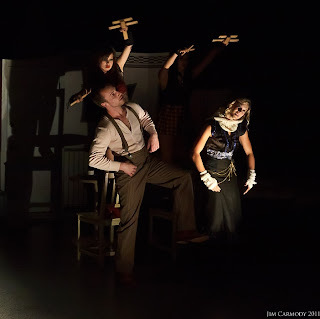 Tickets are on sale now for the ANT FEST performance of SALAMANDER LEVIATHAN @ Ars Nova! Just in time for "Saloween", here's the first video game inspired by the Salamander Leviathan world! 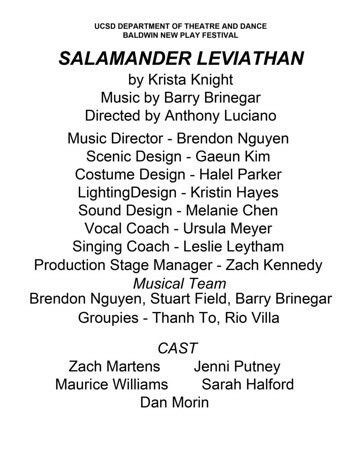 Based on the musical "Salamander Leviathan" by Krista Knight and Barry Brinegar. The left and right arrows control a dropper full of deadly rose acid. Press the [Z] key to drop some in Sal's ear. Drop enough doses into your target to proceed to the next stage. Watch out for backsplash, bits of rose acid will burn your murderous hands! 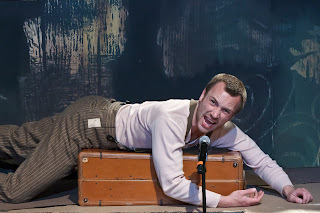 SALAMANDER LEVIATHAN is heading to NYC this Halloween as part of ANT FEST at Ars Nova. In order to make this happen we are fundraising! We're raising money to rent rehearsal space, a healthy dose of fake blood, a tiny stipend for our hard working actors and creative team, and a ticket for our composer Barry Brinegar (lead singer of Arkansas-based David's Pegasus) to join us to develop and play the show for this awesome opportunity. Contributions start as low as $1 and for $15 it's THE WAY to get the CD. 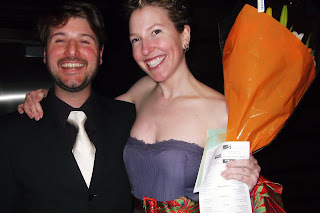 Director Anthony Luciano and playwright Krista Knight on opening night at the Mandell Weiss Forum Theatre. 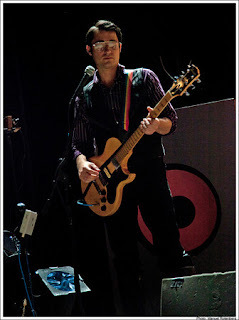 Mr. Carmody shot two albums, one during photo call on 4.16.11 and one during "tech" on 4.14.11. Live footage of the 4.16.11 performance by WalkerVision Interarts, featuring the original cast. Graduates of the MFA Playwriting program have gone on to have their plays produced and commissioned by major regional theaters across the country as well as Off Broadway. This year’s works are filled with passion, insight, humor and magic. “What strikes me about the four plays in this year’s festival,” says professor Naomi Iizuka, head of the MFA Playwriting Program and a renowned playwright in her own right, “is how innovative they are. These plays are all grappling with big ideas and doing so in very fresh, original ways. “In Krista Knight’s ‘Salamander Leviathan,” a meditation on the price of love, a man sells his soul to the devil,” Iizuka continues. “Lauren Yee’s play, “A Man, His Wife and His Hat,” is a wild, delightful fable, featuring a golem, a floating baby and a giant hole in the earth full of memories. The Salamanders took it to the streets on Sunday, April 17th following opening weekend. Cast, crew, friends, and fans met for drinks/dancing at San Diego's Tin Can Alehouse. The show was booked in an effort to bring SL's actors onto a different kind of stage and raise public awareness/interest in the Baldwin New Play Festival. is a musical fantasy with songs...or is this some kind of concert with a play goin’ on? At any rate, the piece is this year’s winner of the KCACTF (Kennedy Center American College Fund) Musical Theatre Award. Guitarist Barry Brinegar is credited with song writing and there are indeed some clever lyrics...Music director Brendan Nguyen is on keyboards, and Stuart Field on drums. Halei Parker’s costumes, especially for the women, are a delight throughout. Salamander Leviathan (appealing Zachary Martens) is the wealthiest man in Wisconsin. His wealth is in the trees on his immense property. But like Faust, Salamander is lonely and wants a wife and family. No sooner said than the black leather-clad Devil (Maurice Williams) appears, red horns and all. The Devil promises Salamander a wife and children in exchange for you-know-what, but this Devil turns out to be the good guy. After all, he was a fallen angel, remember? Anyway, along comes Gracie (lovely Sarah Halford), the potential mother and wife. She has a past (clue: she looks a bit like Amanda Blake as Kitty in Gunsmoke but she’s not that good-hearted). Gracie she wields a vial of poison, a la the traveling troupe in Hamlet enacting The Murder of Gonzago. This poison only gradually incapacitates Salamander, who finally gets his wish. Jenni Putney and Dan Morin, as Gracie’s evil twin and the villain, play other characters in the story, which is imaginative and funny. Click here for Rotenberg's complete album. Anthony Luciano, the director of the Krista Knight-penned “Salamander Leviathan,” a self-described “casio-pop” style musical about what happens when an optimistic man is confronted with the devil, believes the play will have a life after the Baldwins. “Salamander Leviathan” is like the raucous brother of the bunch. The play is a rock ‘n’ roll musical, with tunes written by Arkansas native Barry Brinegar. Even though the play sports some familiar traits — the delta-blues score and sell-your-soul-to-the-devil narrative — Luciano says that it also reflects the state of the world today (all with a “super hot” cast). Here's all of the songs (except interludes/instrumentals) from Salamander Leviathan, in order of appearance, recorded live at the Baldwin New Place Festival at UCSD's Forum Theatre. These tracks are performed by the original cast, recorded by SL's sound designer Melanie Chen. 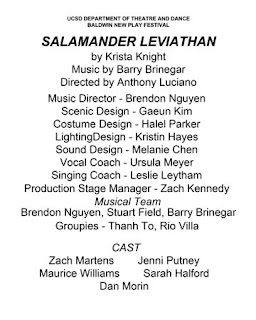 The Kennedy Center American College Theatre Festival has given Krista Knight's play, Salamander Leviathan, this year's award for musical theatre. Here's a full list of all award categories and nominees. Art/music blog We Listen For You had some nice things to say about SL. Click here for the full article. "The Pegasus teamed up with fantastic playwright Krista Knight for Salamander Levithan at the Baldwin New Play Festival at UCSD..."
Thanks for the support, Hank!